Finance Minister Michael Noonan earlier said he wasn’t optimistic a deal could be reached today. EUROZONE FINANCE MINISTERS will continue talks on Wednesday to attempt to reach a deal with Greece on ending its debt crisis. It’s believed that the talks between the Eurozone countries could end in a deal by the end of the week. Earlier today the Greek economy minister, Giorgos Stathakis, told the BBC he was expecting a “very positive communique” from EU leaders about the latest proposals. “They have accepted that the new proposals of the Greek government is a proper framework on which to work on and, with some adjustments that will be the issue of discussion for the next day or so, we’ll end up with proper technical solution as well,” he said. Stathakis said the latest reform offer fit in with his anti-austerity Syriza government’s pledge not to make further cuts to key benefits. There will be new taxation on business and the wealthier part of society and we will save pensions and wages,” he said. European Council President Donald Tusk, who called the emergency summit ahead of a looming Greek debt default at the end of the month, said the Mediterranean nation’s leaders had made their “first real proposals in weeks”. Earlier, Finance Minister Michael Noonan said he wasn’t optimistic that EU leaders will reach a deal today to avoid a Greek default on its debt. He was speaking in Brussels this morning at the start of a emergency summit on the Athens debt crisis with Greece facing default within days unless a deal is struck with its international creditors. Noonan said there had been some confusion overnight because of the alternative versions of the Greek proposal coming through. It is hoped that concessions from prime minister Alexis Tsipras can secure a deal for his country. But Noonan said the events overnight meant that it would be difficult for the finance ministers of eurozone nations to prepare for a meeting of EU leaders later. “There are very low expectations of an agreement today,” he said, adding it was his expectation that there will be another meeting on Thursday before a full meeting of the EU Council. We’re still not quite clear what the actual proposals [from Greece] are. We understand that the Greek authorities have made some movement and that’s to be welcomed. But it’s not clear that the movement is sufficient. It says a lot about the situation in Athens, it doesn’t say anything about the situation in Brussels. Earlier, the EU’s economic affairs commissioner said the fate of Greece and the euro will “largely be decided” today. “We are approaching an absolutely decisive moment,” Pierre Moscovici told French radio, adding that he believed a deal could be reached at the summit for Greece to avoid a default. The latest proposals submitted by Greece “go in the right direction, they can allow a base for an agreement; in other words, there is still a lot to discuss,” he said. But “I think the Greek government has finally understood that it had to send concrete and solid counter-proposals”, he added. France’s Finance Minister Michel Sapin also welcomed the Greek proposals, saying “quality work” had gone into them. 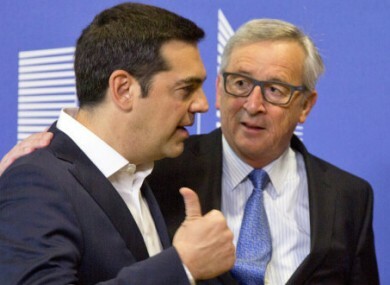 Earlier the office of European Commission President Jean-Claude Juncker said the proposals, which the Greek premier detailed in a phone call with German, French and EU leaders, offered “a good basis for progress”. Greece and its international creditors are wrangling to end a five-month stand-off and agree what reforms Athens will undertake to unlock the latest tranche of its multi-billion-euro bailout in time for it make its latest debt payment and avoid default by June 30. The heads of the 19 eurozone countries will hold an emergency summit on the crisis in Brussels later today under pressure to prevent Greece from defaulting, which could spark Athens leaving the single currency zone. Late last week, the Irish government for the first time acknowledged it was preparing for a possible ‘Grexit’. Noonan said that discussion had been held at a high level with the State assets agency the NTMA and the Central Bank. Email “Enda Kenny says he believes a deal is possible for Greece”. Feedback on “Enda Kenny says he believes a deal is possible for Greece”.